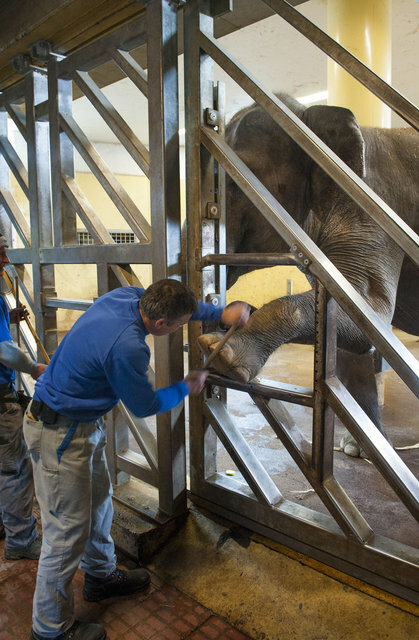 What does a day in the life of a zoo elephant look like? 07:00 The animal keepers begin their shift. The elephant keepers let the elephants go outside into the outdoor enclosure and begin mucking out the stables and the surrounding area. This includes the visitors’ hall, the visitors’ paths and the roads around the elephant house. In addition, there are plants and small animals’ enclosures inside the elephant house which must also be taken care of. Back at the stable, they receive their breakfast. Most days, they get bran soaked in lukewarm water and enriched with salt as well as pellets containing vitamins and trace elements. Finally, the elephants are given water to drink. Standing in its corner, every elephant is washed from head to toe, first with warm and then with cold water. The elephant keepers treat smaller and larger lesions. Their feet are examined and if necessary, their toenails are cut. Young elephants must receive training continuously. Once they have become used to being chained up for their morning wash, they get to know the basic commands. Once a month, all elephant cows and all young elephants are weighed. When all the work is finished, the elephants are released and can now take a bath and splash about in the pool. Except in deepest winter when it is too cold outside, the elephants are allowed outside after their bath. They are given branches which they eat, play with or use to scratch their backs and stomachs with. The branches are important, since they serve both as occupational therapy as well as for their teeth and skin care. Peace reigns at noon. During this time, the elephants doze or take a siesta. 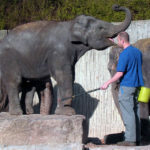 After lunch, the elephant keepers clean the outdoor enclosure. The elephants are again given more branches to keep them busy and, sometimes, also some hay. When Maxie is not in musth, he spends the afternoon with the elephant cows and young elephants in the outdoor enclosure. The bull is welcomed excitedly by the elephant group. For the bull, who has his own stable, the direct contact to the females and young animals is very important, both with regard to his social behaviour and the group dynamic. When one of the elephant cows of the herd has her oestrus, the bull mates with her. The elephants return to the stable and have their main meal of hay, vegetables, fruit and straw. To quench their thirst, they drink water from the pool or from their drinking troughs which are automatically refilled. 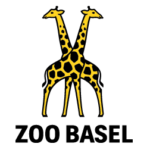 18:00 The elephant keepers and the visitors leave the zoo. The young elephants try to get comfortable on a hay stack and sleep until they become hungry. While the first elephant lays itself down on its side and tries to sleep, the other elephants are still playing with leftover food or with a branch. Are the elephants always stabled at night? In the summer, the elephant cows may either use the stable or the outdoor enclosure. The bull has the outdoor enclosure all to itself in the transitional seasons (spring and autumn) and thus enjoys a bit more space at night. During this time, the elephant cows may use the pool area and, if they feel like it, they can take a bath at night. How does an average day look like for a circus elephant? 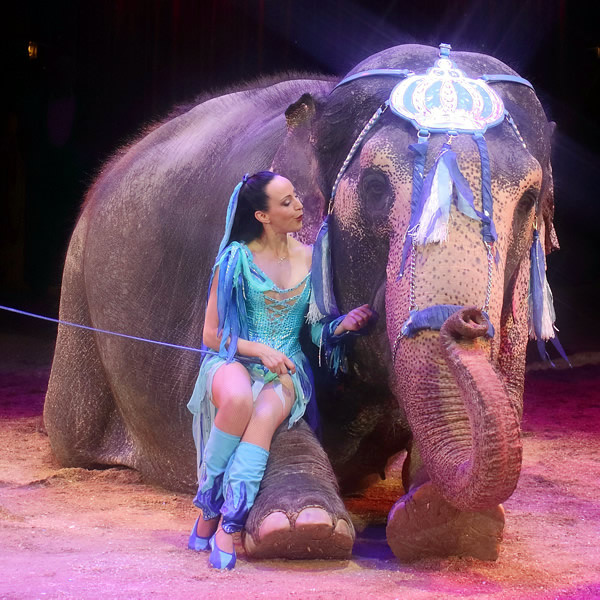 At the circus, the morning is also spent rehearsing the current elephant act and training the elephants for the next season. 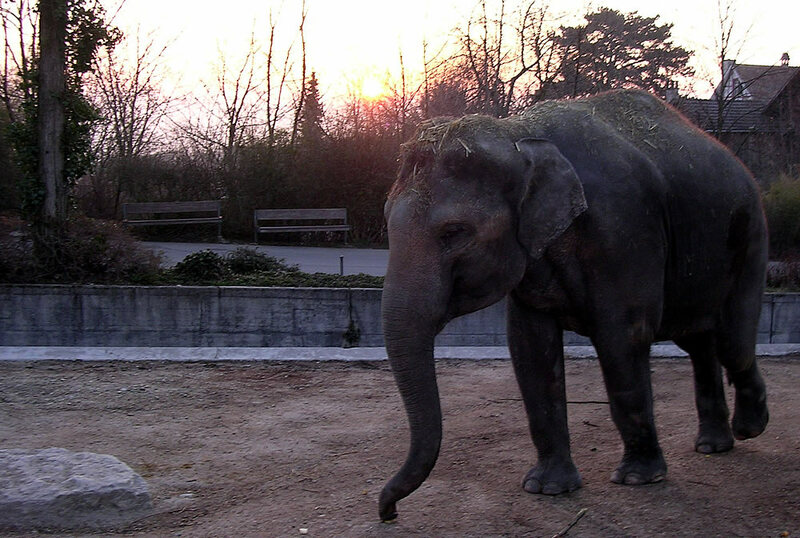 In between the rehearsals and performances in the ring, the elephants are given hay and branches in their “outdoor enclosure”. 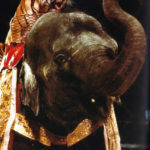 Unless it is a “travelling day”, the elephants receive their main meal after the last performance, after which the whole circus becomes quiet.